As a number of you are aware, I am one of the last defenders of good music. (A bit less heckling at the back, please) Yes, I savour the delights of Talking Heads, Slipknot, Ryuichi Sakamoto and The Cure. And so, it seemed a big sacrifice when I agreed to accompany Gloria to see the penultimate performance by her favourite (boy) band JLS at the O2 Arena. Well, the day arrived on the Saturday before Christmas. It started impressively for Gloria when I drove to the O2 Arena in London guided by the Navigation App on my ancient Android smartphone. I eventually slipped up to the carpark barrier where I had prebooked a parking spot – valid up until 10am the next morning – and the barrier greeted me by name and opened automatically. She was really impressed by that automatic number plate recognition thing. As I work in IT, I took it in my stride. We were at the front of the queue waiting to get in and Gloria needed to go off to find a toilet. I had in her absence started speaking to a lady and her ten year old son. This was in spite of me being the only person in the whole of the O2 that day to be wearing a Slipknot tee-shirt. Being the wind up I am, when Gloria rang my mobile ‘phone to say she was just coming back I told the boy that it was Marvin from JLS ‘phoning me to say he had just finished his tea of sausage and mash and to ask whether I could still drive him home after the concert. He didn’t believe me, but the girl behind me – who I guess was fifteen years old – did! There were three support acts – the best of which was a lady called Hatty Keane. However, she ruined it all with her scanty clothing and provocotive dancing. Predictably, she kept calling her act a show of girl power. Why do women dance in a come-and-get-it-boys way and then call it girl power? 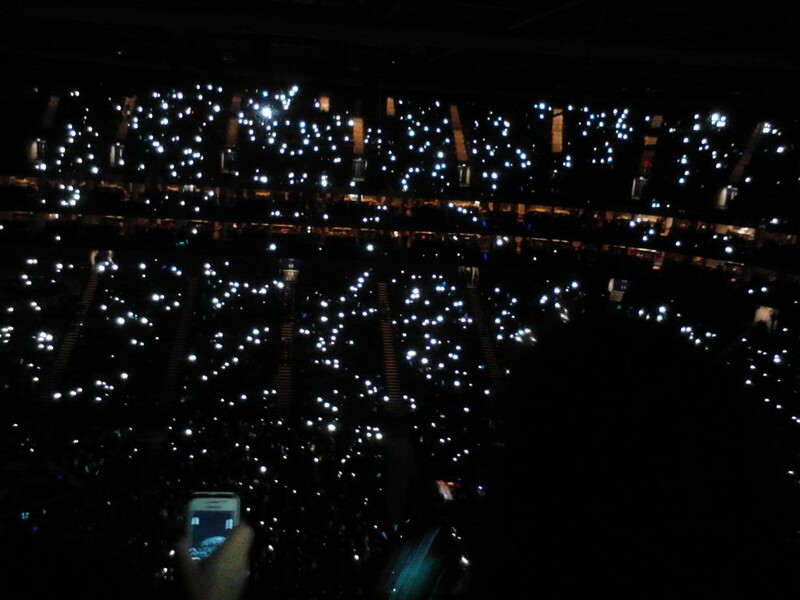 Oh, check out what it looks like when a load of JLS fans hold up little lights that are not cigarette lighters! Well, I did enjoy the JLS show. In fact, I will say that had I never heard them before I would have enquired about them afterwards on the strength of ‘The Club is Alive’. The original single is very annoying but live it sounded fabulous. This was definitely a track that should never have been recorded and only ever performed live. On Christmas Day, we entertained my stepdaughter’s boyfriend for lunch. He came bearing gifts of snacks as his mother decided that he should not turn up empty handed. I managed to set off the smoke alarm at one point making a Christmas Day cooked breakfast – I know that you’d all expect nothing less! Saturday was babysitting with my Mum at my sister’s house and playing with my great-niece who was also there. I’m in my element with young children and I’m especially happy to have more nieces than nephews. Somehow, children talk to me on my level! And how will I see 2014 in? With a glass of something alcoholic and Gloria, of course. Thank you all for being my friends in 2013. Unfortunately, I’m still hanging around next year. You can’t get rid of me that easily.